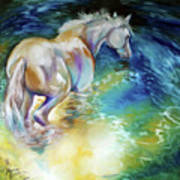 May Waterbaby Equine by Marcia Baldwin - 8.000" x 8.000"
May Waterbaby Equine framed print by Marcia Baldwin. Bring your print to life with hundreds of different frame and mat combinations. Our framed prints are assembled, packaged, and shipped by our expert framing staff and delivered "ready to hang" with pre-attached hanging wire, mounting hooks, and nails. Very Pretty Love all the colors and they way you set it up on canvas! So beautifully done! love this one it is creative and beautiful. Congrats on your sale marcia!! Beautiful colors, shadows, water shimmers. Very pretty! I love the colors and the magic in this piece! Beautiful work on this one,Marcia! Love all your works!Congrats on your sale! Thank you Leszek ... the original is on sale right now on my Ebay !! Go See !! Thank you Carol ......... I love this painting !! Absolutely exquisite, and also enjoyed your description. 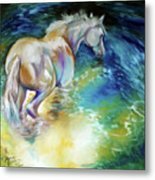 It is said that a new foal born in May will be a "Waterbaby" when it grows up. They love the water and will actually lay down and roll in it... even if you are all saddled up and riding at the time. It is a funny memory of my horse, Velvet. 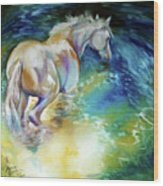 Here, I try to capture the feeling of a May Waterbaby in a blue stream. Enjoy !